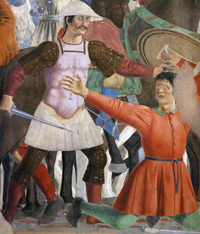 Piero della Francesca in central Italy | Piero della Francesca is one of the leading exponents of the early Renaissance. He worked for the main courts of northern Italy, such as the Malatesta in Rimini, the Medici in Florence and the Montefeltro in Urbino. In Arezzzo the Bacci family originally commissioned Bicci di Lorenzo to paint the apse in the church of San Francesco at Arezzo, but he left Arezzo only having completed the Evangelists and the Last Judgment. Piero della Francesca was commissioned to complete the frescoes in the chapel. 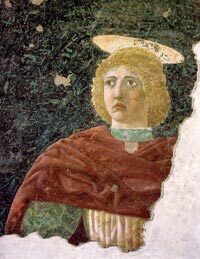 It is one of the major mural painting cycles from fifteenth century Italy. In 1472 he painted his famous double portrait of the Duke and Duchess of Urbino, to admire in the Galleria Uffizi in Florence. At mid-15th century, the small courts of Italy were prospering and in search of painters to decorate their growing estates. One of these was the court of Sigismondo Malatesta in Rimini. Piero executed a Portrait of the nobleman Sigismondo Pandolfo Malatesta, the lord of the city state of Rimini. His work in Rimini also included the fresco of Sigismondo Pandolfo Malatesta Praying in Front of St. Sigismund. In Perugia Piero left the Polyptych of Perugia (also known as Polyptych of St.Anthony), now in the National Gallery of Umbria. Starting from Sansepolcro, his hometown, follow this itinerary, and see his greatest work of Piero della Francesca in Sansepolcro, Perugia, Urbino, Arezzo, Rimini and eventually Florence. Piero della Francesca died, almost blind, the day of the discovery of America, on October 12, 1492, in his hometown Sansepolcro. He is buried here, in the Badia of Sansepolcro. to make, and no thought of rousing us with look and gesture. If they express anything it is character, essence, rather than momentary feeling or purpose. They manifest potentiality rather than activity. It is enough that they exist in themselves. 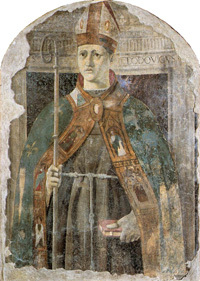 Polittico della Misericordia (Polyptych of Mercy), 1445-1465; Resurrezione (The Resurrection), 1450-1463, fresco; San Giuliano, 1454-1458, detached fragment of a fresco; San Ludovico di Tolosa, 1460, detached fresco. Piero was born in Borgo Sansepolcro, in Tuscany, around 1415, where he started painting with Antonio d’Anghiari. In 1445, he was commissioned to paint the great Polyptych of Mercy by the Misericordia Fraternity (Sansepolcro, Civic Museum). He then worked on it until 1462. 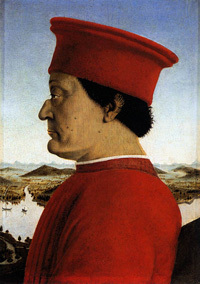 Piero della Francesca worked in various central Italian towns, such as Arezzo, Monterchi, Rimini and Urbino. His major work is a series of frescoes on the Legend of the True Cross in the choir of San Francesco at Arezzo (c. 1452-c. 1465). The subject is a medieval legend of great complexity, the Legend of the True Cross. The chapel belonged to the wealthy Bacci family of merchants in Arezzo, who commissioned its decoration from the Florentine painter Bicci di Lorenzo in 1447. Bicci di Lorenzo left Arezzo only having completed the Evangelists and the Last Judgment. Due to the death of Bicci di Lorenzo, Piero della Francesca was commissioned to complete the frescoes in the chapel. Piero della Francesca was given another important commission in Arezzo: the fresco of Mary Magdalene, painted by Piero around 1465. The Cathedral, the Cattedrale dei Santi Pietro e Donato houses the beautiful fresco of Maria Maddalena, to admire at the top of the north aisle. In Monterchi, on the border of the Umbria region, the Madonna del Parto museum houses one of the best-known works by Piero della Francesca, the Madonna del Parto. The Madonna del Parto played an important role in Andrei Tarkovsky’s Nostalghia (1983). 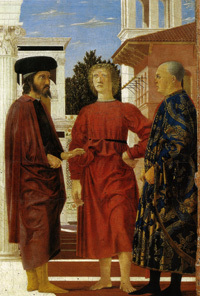 During the 1460s and 1470s Piero was intensely involved with the court of Urbino and with Duke Federigo Montefeltro, for whom he completed some of his most famous works: in 1472 he painted his famous double portrait of the Duke and Duchess of Urbino, Federigo and his wife Battista Sforza (Florence, Uffizi Gallery) and the famous Flagellation (Urbino, National Gallery of Marche). The Flagellation is generally considered Piero's oldest work in Urbino. Before any of the exterior work got under way, Sigismondo began transforming the interior of the old San Francesco church. When Piero arrived, he was tasked with producing a large fresco of Sigismondo himself in one of the three new chapel spaces. 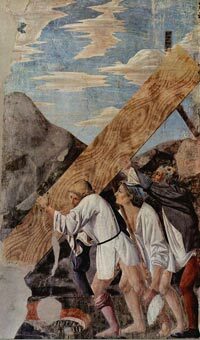 In an earlier St. Jerome painting, Piero had shown a prince kneeling in front of a rustic saint in what seems a forest. In the Sigismondo fresco-today known as Sigismondo Malatesta before Saint Sigismondo-Piero enlarged that supplicant-prince motif. Now the scene is a great throne room. Sigismondo kneels in front of a seated St. Sigismondo, his patron saint. 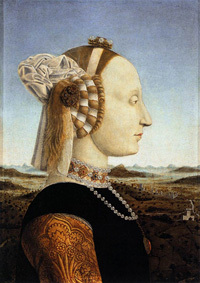 The National Gallery of Umbria, housed in Palazzo dei Priori in Perugia, boasts valuable works of art realized by artists with strong ties to the Umbrian territory. 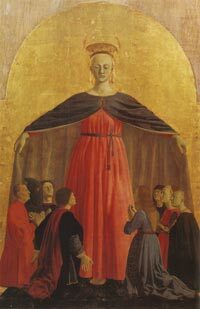 Among the masterpieces, one should note the Polyptych of St. Anthony by Piero della Francesca, and the Polyptych of San Domenico by Fra Angelico. 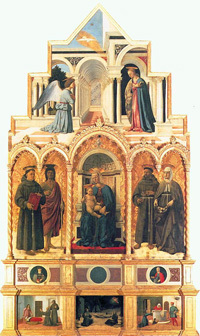 The Polyptych of Perugia (also known as Polyptych of St.Anthony) is a complex of paintings by Piero della Francesca, finished around 1470, portraying in the center the Madonna and Child, one on their sides Saint Anthony of Padua, John the Baptist, Francis and Elizabeth of Hungary, on the summit the Annunciation set in front of an extraordinary escape perspective. Six cities (Rimini, Urbino, Sansepolcro, Monterchi, Arezzo, Perugia) and 4 regions (Emilia Romagna, Tuscany, Le Marche, Umbria) together invite you to a journey in the footsteps of Piero della Francesca. A breathtaking itinerary across art, culture, history, tradition and great food. Landscapes that inspired Renaissance painters such as Piero della Francesca, Raphael, Leonardo da Vinci are hidden in the hills of Montefeltro. 23rd of june 2012, the ‘Balconies of Piero della Franscesca were inaugurated. Different observation points where the landscape that served as background to the renaissance painter can be admired. Today, you can access a new app for the trail, which enables you to locate the exact topographical spots believed - though not without contention - to have inspired the panoramas in some of Piero's paintings. Observation points, known as Piero's Balconies, high up on the rugged hillsides between Sansepolcro, Rimini and Urbino, have been meticulously mapped out by academic researchers Rosetta Borchia and Olivia Nesci. In a previous publication, “Codice P. - Atlante illustrato del reale paesaggio della Gioconda” ("Code P, The Illustrated Atlas of the Mona Lisa’s Real Backdrop”), published by Electa, Olivia Nesci and Rosetta Borchia presented the results of a four-year research project, which led to identifying the Mona Lisa backdrop right in the Valmarecchia (Montefeltro) area. 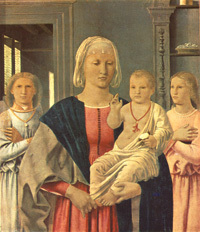 Foto: Piero della Francesca, dettaglio dal ciclo di affreschi della Leggenda della santa Croce nel coro della Basilica di San Francesco ad Arezzo.